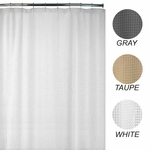 EZ ON Fabric Shower Curtains - Checkered Window Pane - No hooks needed! No shower hooks required! The EZ On fabric shower curtain has built-in shower rings which simply snap on to the shower curtain rod making it quick and easy to hang. 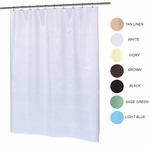 The EZ On shower curtain is 70"W x 72"L and 100% water repellent. Because it is water repellent, no shower curtain liner is required. Available in white or ivory.